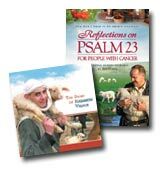 Reflections on Psalm 23 for People With Cancer - Ken Curtis, founder and president of Vision Video and Christian History Institute, was diagnosed with advanced cancer and given little hope for survival. He pursued a combination of traditional and alternative medicine, undergirded by a strong spiritual dimension and prayer support team. Psalm 23 was a vital part of his spiritual component, and for this video Curtis went to Israel, home of David, writer of the Psalm, to be with the shepherds, travel "through the valley of the shadow of death," and explore and enjoy the healing powers of the green pastures and still waters. The resulting 13 meditations are about eight minutes each and provide a combination of candid personal experience of what it means to battle cancer and some of the spiritual resources available to all in this time-honored Psalm. A co-production of Vision Video and Nazareth Village. And Sheep May Safely Graze - Pastoral Suites from Nazareth Village is a music CD with gentle melodies of Jewish and Arabic musical traditions from the Middle East. Copyright 2007 by Michael Moricz.